Until William Primrose emerged in the 1930s, Britain was not famed for producing string players, and three decades passed before another British player of similar star quality, Jacqueline du Pré, astonished the world. Primrose’s rise, which saw him co-operate on equal terms with Jascha Heifetz, Emanuel Feuermann and Gregor Piatigorsky, was all the more extraordinary because it represented a career change. Until 1930 Primrose, born in Glasgow in 1904, was an excellent but not especially startling violinist. Once he had joined the London String Quartet as its violist, he took on a new lease of life and was soon a leading soloist. After a spell in Toscanini’s NBC Symphony in New York, he had the courage to go completely solo; and because much of his career was made in America, he achieved a level of fame unknown to other viola pioneers such as Lionel Tertis in England, Maurice Vieux in France and Vadim Borisovsky in Russia. He also played much better than his main international rival in the 1930s, Paul Hindemith. The somewhat cocky, even pugnacious, Scot was given a good start in Glasgow by the Sevcík pupil Camillo Ritter. Once he moved to London he learnt much from hearing such musicians as Kreisler, Casals and Heifetz. Summers spent with Eugène Ysaÿe – who heard something in his tone suggesting an aptitude for the viola – lent both his bow arm and his left hand a touch of Franco–Belgian flexibility, and playing Mozart’s Sinfonia concertante with Tertis in Paris in 1928 gave him an idea of the viola’s capabilities. But the two always diverged in their approach: Tertis found Primrose’s viola playing too violinistic and his vibrato too fast; Primrose found Tertis’s C string bias too heavy. 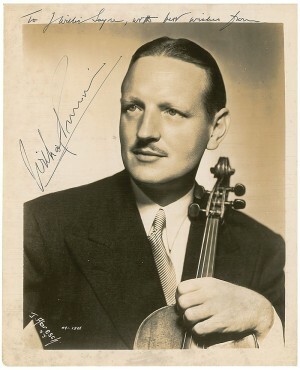 From the start of his recording career as a violist in 1935, Primrose challenged perceived ideas of how a viola should behave, playing Paganini’s Caprices and other virtuoso works. Above all, he released a kaleidoscope of colours from the viola, especially from the middle two strings, the most evocative and haunting register of the instrument. He was helped by the fact that his father John – an orchestral violinist and violist and later Sir Thomas Beecham’s LPO librarian – was a keen instrument collector. Primrose began his viola career on his father’s Brothers Amati, which was a cut-down model and was quite small, but had a wonderful contralto depth of tone. By 1944 he was flirting with instruments such as the ‘Macdonald’ Stradivari, on which he recorded Harold in Italy with Koussevitzky. In 1950 he acquired a new viola by William Moennig and the following year he sold the Amati to Ferenc Molnar. The Moennig – strung with metal, like his other modern viola by Pierre Vidoudez – was used for Harold in Italy with Beecham. In 1954 Primrose bought the 1697 ‘Lord Harrington’ Guarneri, from which, despite its greater body length (41.3 cm as opposed to 39.8 cm on the Amati) he drew a more mezzo-soprano tone than he had from the Amati. Was this a function of the new instrument, or of Primrose’s revised attitude to viola tone? Even with the Amati, he had often produced a lighter sound in his post-war recordings, perhaps under the influence of Heifetz. We can compare the 1941 and 1956 versions of Mozart’s Sinfonia concertante, where the contrast between the darker Amati and lighter Guarneri is startling. But with both instruments, Primrose created astonishing colours. In a 1956 recording of Beethoven’s E flat major Piano Quartet with the Festival Quartet, his plangent tone in the Andante cantabile is memorable. The viola solo in the Adagio non troppo of the 1960 Fauré G minor Piano Quartet with this ensemble should also be heard, likewise the Andante of the 1959 Mozart C major Quintet with the Griller Quartet, where Primrose plays first viola. With the Guarneri, Primrose soon changed to using gut for two strings – he found that fitting a gut A enriched the other extreme of the range and made the C string sound better. He then had recordings scheduled with Heifetz and, knowing that the violinist used gut A and D strings, he changed his D to gut as well. Those interested in the evolution of the Heifetz–Primrose partnership can compare the string trio recordings with Feuermann with those with Piatigorsky. Live recordings and anecdotal evidence indicate that with all his violas, Primrose produced an excellent quality and volume of tone, but in some ways his playing was better balanced on the Guarneri than it had been previously. It was perhaps this equality of sound on all four strings that led him to state in his memoirs, A Walk on the North Side, that he preferred ‘the mezzo quality of the Stradivari or Guarneri as opposed to the contralto sound of the Gaspar da Salò and kindred instruments’. Also see our feature on the ‘Primrose’ Guarneri viola.